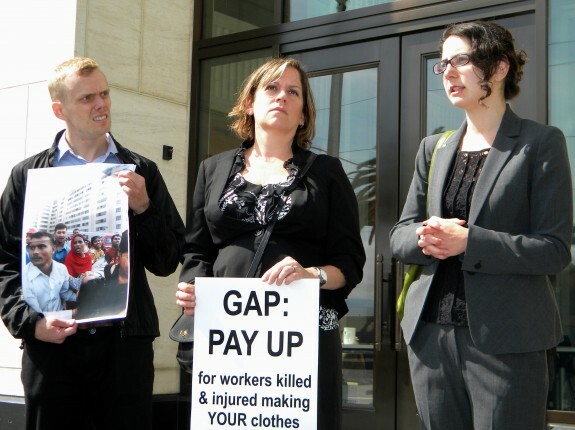 Martin Caldwell (sumofus.org), Sara Steffens (The Newspaper Guild) and Sarah Church (International Labor Rights Forum) speak outside of GAP’s annual shareholder meeting in protest of the company’s refusal to join in an accord that protects Bangladeshi workers’ health and safety. Photo by Staff 2014. SAN FRANCISCO, CA – Community activists gathered from across the Bay Area to protest the status of safety conditions and labor rights, outside the annual shareholders meeting on Tuesday at the GAP headquarters at 2 Folsom in San Francisco. Reprinted with permission from Sfnewsfeed.us/Jose Ricardo Bondoc.